Before the birth of athleisure, sweatpants were reserved for sick days, lazy Sundays, and evenings at home after a day in denim, trousers, or a dress. Your preferred pair was likely an oversized, hip-slung, fleece-y-on-the-inside pair that would never cross the threshold of your front door but felt gloriously cozy with thick socks and a tee. Now, thanks to the rise of streetwear and the popular hygge movement (the Danish term for peak cozy), sweats are no longer seen as sloppy. The comfy bottoms are now an acceptable article of clothing to wear in public—and not just to the gym. From slimmer cuts to high-rise waists and elasticized hems, sweatpants are designed with a heck of a lot more form than they used to be—i.e. working out or lounging on your couch. Though designer sweats abound, James-Williams is as much for classic Hanes as she is a straight-off-the-runway style. “I greatly appreciate this Hanes Classic Men’s style with the elastic on the waist and ankles. I typically size down two sizes for a nice snug fit—they’re super affordable and have the most classic style, you can’t beat it.” For a slimmer look like this pair from Uniqlo, the stylist suggests going oversized for a fresher effect, something Shopbop’s fashion director, Caroline Maguire agrees with. “When it comes to sweats, I try to stay away from anything too bodycon and fitted,” she tells me. Instead, Maguire recommends a cool, drop-crotch shape or a style with an adjustable drawstring waistband. As for styling, James-Williams likes a classic tracksuit look such as a coordinating sweatshirt-and-pant set with smart accessories like a simple slide or heeled boots and a tailored third piece on top. Think: a blazer, tailored coat, or classic trench. For more of a fashion-leisure look, she says to layer a high-neck shirt beneath a sweat set and add in a cool dad sneaker and sleek bag for an elevated finish. Chunky gold hoops or an ‘80s-inspired chain will take both of these formulas a step further for a dressier effect. 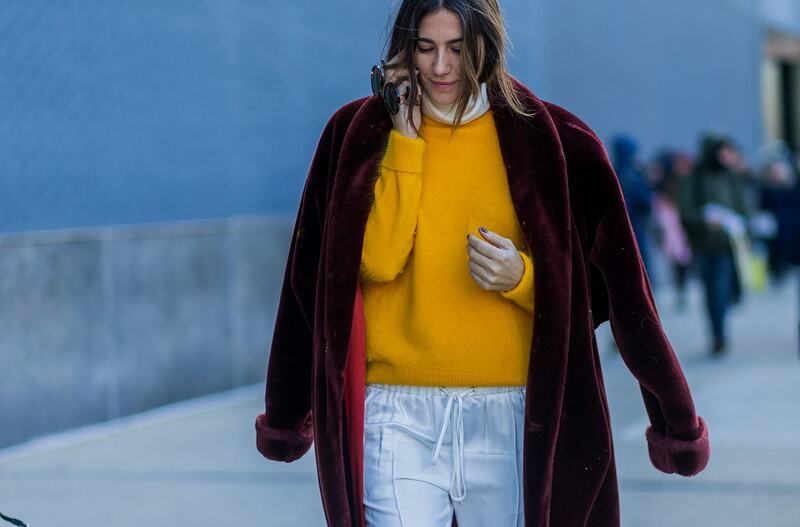 Ahead, find 15 stylish pairs of sweatpants that offer some serious inspo. You don’t want to just lounge around in these. If you’re in need of a new third piece to top off your look, here are this season’s most popular winter jacket styles.